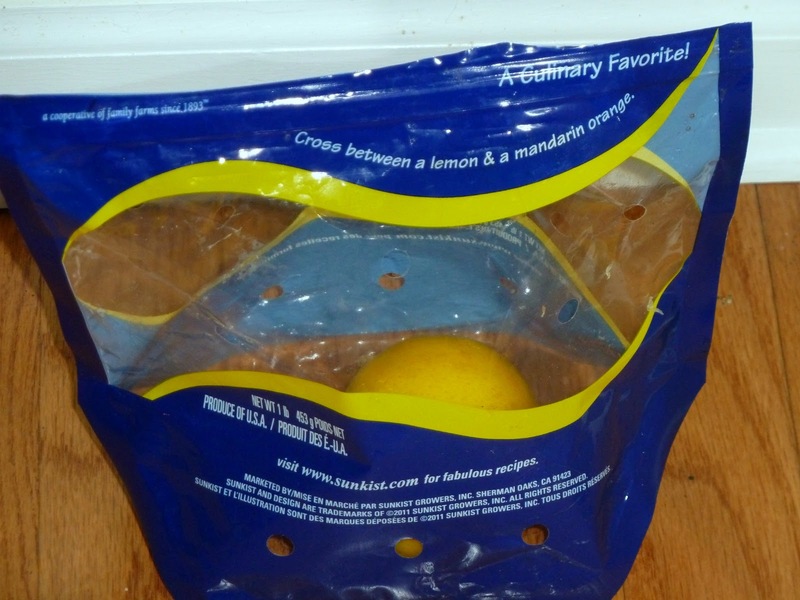 I was in the grocery store over the weekend, and saw Meyer Lemons in the produce department. I have seen so many recipes and posts on the blogosphere, but never seen them in the produce department before. I guess that they have never been on my radar. Well, I bought them and had to make lemon bars for my hubby, who loves anything lemon. I made them while decorating my Christmas tree. The bars were great, just ask my husband. I only made an 8x8 pan, but I want to freeze the rest of them. Has anyone ever frozen lemon bars? 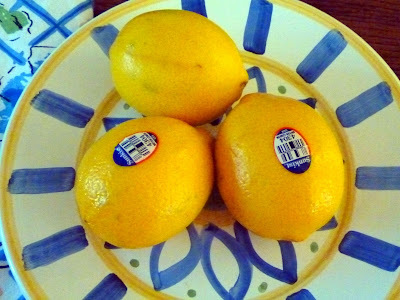 Here are my Meyer Lemons, stickers and all. One of the lemons didn't have a sticker. Is that really a Meyer lemon? I only used two of the lemons, juice and zest for the recipe. I haven't used the the third one yet. The Meyer Lemon bars had a slightly different taste, less acidic, and very lemony, so good on top of the shortbread crust. I will definitely freeze the rest, so I don't eat the whole pan of them, he, he. These would be a a great addition to your Christmas Cookie plate. I usually make them for my husband, anyway. Enjoy! In a medium bowl, blend together softened butter, 1 cups flour and 1/4 cup sugar. Press into the bottom of an ungreased 8x8 inch pan. Bake for 15 to 20 minutes in the preheated oven, or until firm and golden. In another bowl, whisk together the remaining 3/4 cups sugar and 1/4 cup flour. Whisk in the eggs and lemon juice. Pour over the baked crust. Bake for an additional 20-25 minutes in the preheated oven. The bars will firm up as they cool. When cool, dust with powdered sugar. ***Note I got almost 2/3 cup lemon juice, so increased the flour in the filling to1/3 cup, and the bars were nice and firm. Lemon bars are my all-time favorite, and has been for a long time. 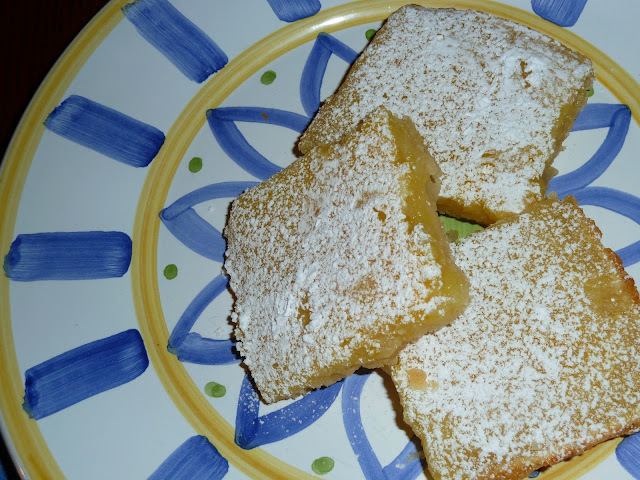 Your lemon bars turned out perfect, and lemony yumminess! 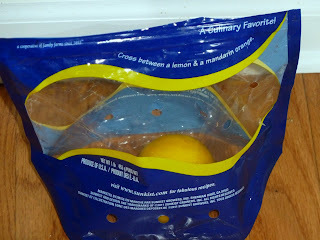 Unfortunately I have not seen any Meyer's lemons in our stores, so far yet...every good lemon recipe is always mentioning Meyer's! Elisabeth-These lemon bars turned out so well. they were my first time baking with Meyer Lemons. I don't know how long they are available. they were grown in the USA. Emily- These lemon bars are very good! You will have to try them. Yum...I ADORE Meyer lemons! They have such a nice flavor...less sharp than a standard lemon. They seem to be available only for a short time here in Texas, so I love to buy them when I can! Jill-I think that they are only available for a short time, so check with your local produce Mgr., to see when they might be coming to you. I had never baked with them either. Wendy- This was my first time baking with them, and I will bake with them again, when they are available;) they did have a milder flavor, which was very good.